As spring and summer weather melts the mountain snow around Park City, rivers swell and rafting companies pull out their rafts to lead guests on a wet and exciting adventure. It's hot outside during the summer, but the water will certainly keep you cool on these whitewater rivers. The rapids are sized for the entire family, neither too big for the younger ones or too small for adults. A half-day is enough to get out on the Provo or Weber rivers, located close to Park City. Other options may require more of a drive to arrive at the river, but offer an entirely different experience. 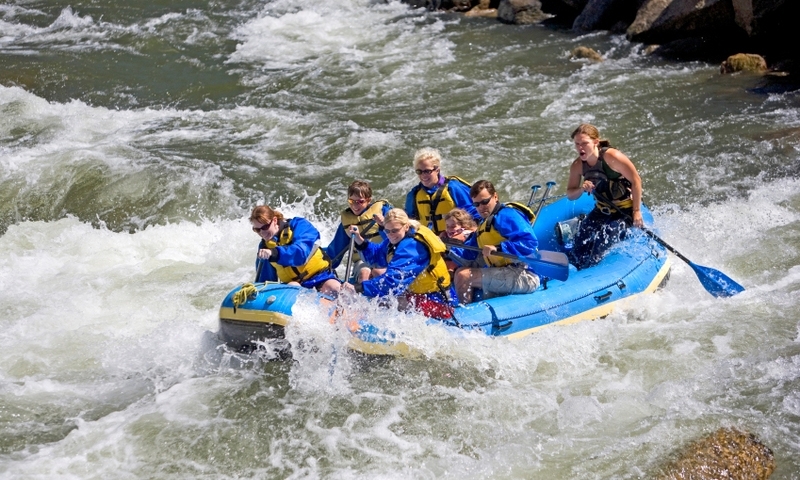 This is a short list of the most popular rivers for Park City rafting. Nearby, there are a number of other quality rivers to raft, including Duchesne River, Uinta River, Strawberry River and more. Descend the Weber River over rapids which range from Class I to Class III. This trip will take you through the red walled Weber Canyon, a beautiful example of one of Utah's unique mudstone canyon formations. Trips range from two hours to a full day with a delicious lunch to satisfy every paddler's appetite. If you're looking for a milder whitewater experience, try the Provo River. These Class I and II rapids are ideal for all ages. This trip takes you through Provo Canyon, in the shadow of the spectacular 12,000-foot Mount Timpanogos. This river is only run in the spring and early summer when the water is flush with snowmelt from the Uinta Mountains. Class II rapids take rafters into the technical and wild territory on the Wyoming/Utah border. Keep your eyes peeled for moose! This river is best experienced on multi-day trips, with both the White River and Yampa River joining the main river on its course to the Colorado. Most trips last from a half-day to two or three days, but guides will also arrange longer trips up to five days or more. Be sure to include the Flaming Gorge, where high red canyon walls keep the river twisting and turning. The Lodore Canyon traces the path of the first explorers of the west, including the Powell Expeditions. Expect to see Indian petroglyphs and pictographs.